I couldn’t think of a better excuse to start over for the new year. We had a decent offer on the domain, “theintercept.com”, so this will be the opportunity to roll out another blog exploring the hypocrisy and origins of the war on terror. Receive updates for the upcoming movie of the same name. The new domain will be www.americanterrorist.com. Join us or die! Would You Fight Arizona Computer Vote Fraud for 7 Years? Would you believe that the United States tried to do something that was not nice against Hugo Chávez? Wikileaks has done it again. I guess the US will really have to get tough now with Julian Assange and Bradley Manning. During his 8 years in power, President Chavez has systematically dismantled the institutions of democracy and governance. The USAID/OTI program objectives in Venezuela focus on strengthening democratic institutions and spaces through non-partisan cooperation with many sectors of Venezuelan society. USAID/OTI = United States Agency for International Development/Office of Transition Initiatives. The latter is one of the many euphemisms that American diplomats use with each other and the world – They say it means a transition to “democracy”. What it actually means is a transition from the target country adamantly refusing to cooperate with American imperialist grand designs to a country gladly willing (or acceding under pressure) to cooperate with American imperialist grand designs. OTI supports the Freedom House (FH) “Right to Defend Human Rights” program with $1.1 million. Simultaneously through Development Alternatives Inc. (DAI), OTI has also provided 22 grants to human rights organizations. Freedom House is one of the oldest US government conduits for transitioning to “democracy”; to a significant extent it equates “democracy” and “human rights” with free enterprise. Development Alternatives Inc. is the organization that sent Alan Gross to Cuba on a mission to help implement the US government’s operation of regime change. OTI speaks of working to improve “the deteriorating human rights situation in” Venezuela. Does anyone know of a foreign government with several millions of dollars to throw around who would like to improve the seriously deteriorating human rights situation in the United States? They can start with the round-the-clock surveillance and the unconscionable entrapment of numerous young “terrorists” guilty of thought crimes. OTI has directly reached approximately 238,000 adults through over 3000 forums, workshops and training sessions delivering alternative values and providing opportunities for opposition activists to interact with hard-core Chavistas, with the desired effect of pulling them slowly away from Chavismo. We have supported this initiative with 50 grants totaling over $1.1 million. This is the classical neo-liberal argument against any attempt to transform a capitalist society – The revolutionaries are creating class conflict. But of course, the class conflict was already there, and nowhere more embedded and distasteful than in Latin America. One has to wonder if the good ambassador (now an Assistant Secretary of State) placed any weight or value at all on the election and re-election by decisive margins of Chávez and the huge masses of people who repeatedly filled the large open squares to passionately cheer him. When did such things last happen in the ambassador’s own country? Where was his country’s “concern for the Venezuelan people” during the decades of highly corrupt and dictatorial regimes? His country’a embassy in Venezuela in that period was not plotting anything remotely like what is outlined in this cable. Notice the key word – “crisis”. For whom was Hugo Chávez’s Venezuela a “crisis”? For the people of Venezuela or the people who own and operate United States, Inc.? Imagine a foreign country’s embassy, agencies and NGOs in the United States behaving as the American embassy, OTI, and NGOs did in Venezuela. President Putin of Russia recently tightened government controls over foreign NGOs out of such concern. As a result, he of course has been branded by the American government and media as a throwback to the Soviet Union. Under pressure from the Venezuelan government, the OTI’s office in Venezuela was closed in 2010. Last month numerous foreign-policy commentators marked the tenth anniversary of the fateful American bombing and invasion of Iraq. Those who condemned the appalling devastation of the Iraqi people and their society emphasized that it had all been a terrible mistake, since Iraqi leader Saddam Hussein didn’t actually possess weapons of mass destruction (WMD). This is the same argument we’ve heard repeatedly during the past ten years from most opponents of the war. But of the many lies – explicit or implicit – surrounding the war in Iraq, the biggest one of all is that if, in fact, Saddam Hussein had had those WMD the invasion would have been justified; that in such case Iraq would indeed have been a threat to the United States or to Israel or to some other country equally decent, innocent and holy. However, I must ask as I’ve asked before: What possible reason would Saddam Hussein have had for attacking the United States or Israel other than an irresistible desire for mass national suicide? He had no reason, no more than the Iranians do today. No more than the Soviets had during the decades of the Cold War. No more than North Korea has ever had since the United States bombed them in the early 1950s. Yet last month the new Defense Secretary, Chuck Hagel, announced that he would strengthen United States defenses against a possible attack by [supposedly] nuclear-equipped North Korea, positioning 14 additional missile interceptors in Alaska and California at an estimated cost of $1 billion. So much for the newest Great White Hope. Does it ever matter who the individuals are who are occupying the highest offices of the US foreign-policy establishment? Or their gender or their color? “Oh,” many people argued, “Saddam Hussein was so crazy who knew what he might do?” But when it became obvious in late 2002 that the US was intent upon invading Iraq, Saddam opened up the country to the UN weapons inspectors much more than ever before, offering virtually full cooperation. This was not the behavior of a crazy person; this was the behavior of a survivalist. He didn’t even use any WMD when he was invaded by the United States in 1991 (“the first Gulf War”), when he certainly had such weapons. Moreover, the country’s vice president, Tariq Aziz, went on major American television news programs to assure the American people and the world that Iraq no longer had any chemical, biological or nuclear weapons; and we now know that Iraq had put out peace feelers in early 2003 hoping to prevent the war. The Iraqi leaders were not crazy at all. Unless one believes that to oppose US foreign policy you have to be crazy. Or suicidal. In any event, the United States did not invade Iraq because of any threat of an attack using WMD. Washington leaders did not themselves believe that Iraq possessed such weapons of any significant quantity or potency. Amongst the sizable evidence supporting this claim we have the fact that they would not have exposed hundreds of thousands of soldiers on the ground. On election day, November 6, Proposition 37 – the ballot initiative for mandatory labeling of food with GMO content – failed by a narrow margin. With 4,277,985 people voting “yes” (47.9%) and 4,835,045 people voting “no” (53.1%), it was very close. Since then, some rumors have been going around about possible election fraud. Food Democracy Now!, one of the groups involved in Prop 37 has been closely monitoring the results as they came in, and they hadn’t seen any credible reports of voting irregularities, that is up until now. On Thursday, Food Democracy Now! received some very disturbing news from a voter integrity monitor. This monitor claims that possible “statistical anomalies” had been detected in 9 counties in California. Since then, a team of independent statisticians has started analyzing raw voter data or “preliminary data from 17 of California’s 58 counties”. So far, potential anomalies have been detected in a number of the largest precincts in Orange, Los Angeles, San Francisco, Alameda and San Diego counties, among others. While it is not definite that election fraud has actually taken place, it is important for Prop 37 supporters to be aware that the results of the election as they stand are not final. Food Democracy Now! is asking supporters to stand with them as they call for further inquiry into the questionable patterns being revealed. Then something strange happened. Less than one hour later. the California Secretary of State’s website no longer showed the 6 million vote total. Food Democracy Now! had captured a screenshot (see image below) and had tweeted the image. They then got in contact with the Secretary of State’s office and when they asked about the discrepancy, they were told that the office would no longer be updating the vote total until after December 14th, when the election is required by law to be certified. When asked why, the Secretary of States’ office claimed that making updates to the official site was “no longer cost effective”. The Secretary of State’s office refused to give the number of remaining uncounted ballots and only continued to say that the information would not be updated until December 14th. This seems odd, since the Secretary of State’s website had updated the vote count every day until December 4th, when the Yes side briefly appeared above 6 million votes. While it is still possible that Yes on 37 has failed, it is also possible that election fraud is being committed, and it is necessary to stand up for open and transparent elections and to ask California Secretary of State Debra Bowen to make sure that the election results from Prop 37 are properly counted. Arizona Election Fraud: Is Arizona’s Secretary of State Feigning Ignorance Over Terry Goddard’s RTA Investigation? Arizona’s Secretary of State’s office has issued a surprising answer to Supervisor Ramon Valadez’s request for ballot scanning. Contrary to what has been publicly revealed and analyzed in Arizona Attorney General’s public recount of the 2006 RTA election, Arizona’s Secretary of State’s office issued a memo citing the “accuracy” of Goddard’s recount as a reason to forego graphic scanning of ballots. Perhaps they aren’t aware of the chimpanzee hacking the very same GEM’s elections system, but we do know that it’s incredibly naive to suggest that the need for election audits could only be defined by the potential accuracy and reliability of the machines – not the people running the machines. So why would the Secretary of State choose to mislead the public with a letter alluding to “accuracy” in Arizona Attorney General Terry Goddard’s RTA investigation? 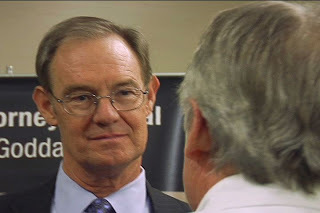 It was Goddard’s ill-faited recount of the 2006 RTA election that became part of the legal argument for prospective relief in rigged elections which won an appellate court decision in 2010. Goddard proclaimed in his press conference that they did such a good job, they found 63 additional ballots. Evidently, this was supposed to distract the public from the fact their count was missing four precinct’s worth of ballots. Goddard’s investigation was so bad it garnered national attention on the Mike Malloy show once it was discovered that over a third of the poll tapes (that Goddard refused to inspect) were missing. The missing poll tapes strongly correspond with electronic records of the RTA election showing memory card re-uploads characteristic of an attempt to pre-program memory cards. From the perspective of a statistical analysis, one only has to consider the odds of the same precincts experiencing the same re-upload errors correlating to the same missing poll tapes. Goddard had also refused to perform a forensic exam of the ballots, despite a previous move by the county to compromise court evidence. On the day of his press conference, Goddard acknowledged to the public on the John C. Scott show that he was aware of Pima County violating a court order by compromising evidence in the county vault. Adding to the need for a forensic exam, court testimony indicated that no adequate protection of the stored RTA ballots took place until a court order was issued in 2011. Attorney General Terry Goddard clearly moved beyond what is considered ‘executive discretion’ and served in some capacity to ensure Pima County’s right to commit election fraud. When the Secretary of State’s office cites Goddard’s work as cause to forego graphic scans as a safeguard against election fraud, they are placing themselves in the same camp, especially when Pima County is now the main obstacle to a forensic exam of the RTA ballots. 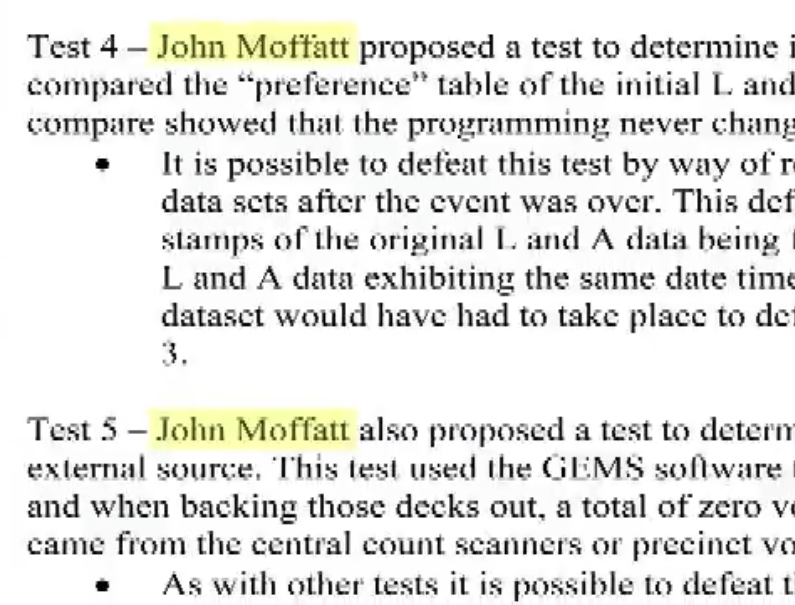 John Moffatt’s name is all over the I-Beta report. Moffatt represents the suspect in this investigation. Terry Goddard’s investigation into the RTA election showed early signs of compromise as the suspects in the investigation (Pima County) were given the opportunity to shape the investigation. This took place through Pima County employee John Moffatt, who was afforded the opportunity to make himself an inextricable part of the report created by the independent data firm, I-Beta. 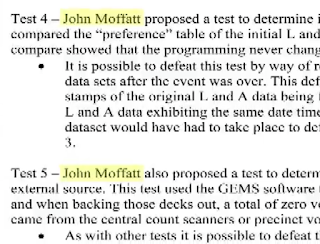 Moffatt was also named in the I-Beta report providing many ineffectual tests that were certain to be meaningless in the first half of Goddard’s investigation. Since Goddard stated in public that he was aware of Moffatt being caught with his hand in the ‘evidence cookie jar’,the decision to include Moffatt in this process demonstrates highly questionable judgment. By this time, it was clear that John Moffatt, working directly under Pima County Administrator Chuck Huckelberry, was responsible for the convoluted logic that ultimately cost Pima County over one million dollars in legal fees resisting disclosure of public records. Goddard continued coddling the suspects as he refused to provide the results of the I-Beta report to those who filed the initial complaint, but let the suspect (Pima County) receive a copy and subsequently instructed the suspect not to provide a copy to those who filed the initial complaint. These conflicts of interest were so widely publicized it would be difficult for the Secretary of State’s office to make a credible claim of ignorance. The Secretary of State’s office should direct its attention to the money being wasted by Pima County as they use every legal measure permissible to stave off a forensic exam of the RTA ballots. Pima County’s Superior court judges have been ruling in defiance of the 2010 appellate court decision granting jurisdiction for prospective relief in rigged elections. Before any court orders affecting election procedures are issued, the hearing for prospective relief needs to complete the fundamental tasks ignored by Attorney General Terry Goddard. The court must allow for the actual audit of the ballots (comparing, for the first time, one set of numbers to another set of numbers) and a forensic examination of the ballots. In fact, if the audit and forensic exam do not turn up evidence of foul play, the court does not have sufficient cause to issue orders for prospective relief. That outcome would end the case. So why is Pima County the primary obstacle to this investigation? All local media outlets fail to articulate this inescapably simple resolution that Pima County avoids. Everyone endowed with basic cognitive skills is left with the uncomfortable realization that Pima County has been caught cheating and they are staving off the inevitable with taxpayer’s dollars. If the Secretary of State’s office is so confident in Terry Goddard’s investigation of the 2006 RTA Ballots, they should encourage Pima County to stop wasting taxpayers dollars and to stop obstructing the appellate court ruling for prospective relief. That way, the Secretary of State’s office could demonstrate leadership in state elections instead of what appears to be an elections ‘circle jerk’. FINLAND, Minn. – Nov. 12, 2012 – The Organic Consumers Association (OCA) is monitoring the ongoing vote count and election results for Prop 37, the California Right to Know Genetically Engineered Food Act. The OCA will contest the vote if results differ substantially from pre-election poll results or if there are reports of any voting irregularities, particularly in Orange and San Mateo Counties where paperless ballot systems make voting more vulnerable to fraud. State law requires county elections officials to report their final results to the Secretary of State by December 7. The Secretary of State has until December 14 to certify the results of the election. The OCA hired Lake Research Partners to conduct pre-election polling for Prop 37. The final results of the polling are not yet available. Activists in Washington State have already collected more than half of the signatures they need to put a similar GMO labeling initiative on the ballot there in 2013. Plans are also in the works to reignite legislative attempts in Vermont and Connecticut, where laws don’t provide for citizens ballot initiatives. The Organic Consumers Fund is a 501(c)4 allied organization of the Organic Consumers Association, focused on grassroots lobbying and legislative action. The Pima County Board of Supervisors refused to conduct a proper hand-count audit of the 2012 general election ballots. This decision was made despite seasoned statisticians and computer experts in its own Election Integrity Commission indicating that the county’s elections are not verifiable in their current state. This postponement plays a role in solidifying the board’s argument that ‘it’s too late’. Huckelberry’s recent memo, which is rife with distortions and errors, states that it’s impossible to do a hand count audit. Such hyperbole was thoroughly eviscerated by Mickey Duniho’s point by point response to the erroneous memo. Duniho provided his rebuttal in writing to each member of the board of supervisors. “Your elections are being run by a sociopath,” said EIC member Jim March. Elections Director Brad Nelson was held under a burning magnifying glass in the most recent Board of Supervisors meeting as March leveled a series of new charges against Nelson. First, March states that Nelson had his county-issued credit card yanked for fraud, yet he still keeps his job. Other charges had to do with Nelson’s management style with his employers. According to March, employees are willing to recall how they were retained because it was easy for Nelson to “make them cry” and “that’s something he needed to do on occasion”. Finally, March accused Nelson of breaking the law as he states that Nelson would ask temporary staff and poll workers to switch their party allegiance so that he can continue to retain these employees for future tasks. Jim March’s history of careful, meticulous analysis before calling any one person’s reputation into question adds significant weight to these charges. We can only hope that an independent investigation into Brad Nelson’s activities will take place. The only Supervisor concerned about having verifiable elections for this elections cycle was Ray Carroll, a Republican who has consistently moved to transcend party affiliation and improve transparency. Arizona solidifies its national reputation as the ‘meth lab of democracy’ because those who can intervene refuse to make direct, immediate, substantive changes to the elections process.